Wright was born in Washington, D.C., to a mother who worked as a customs lawyer and a father who died when Wright was a child. He graduated from St. Albans School and attended Amherst College, receiving a bachelor's degree in political science and planned to attend law school; however, he decided to study acting instead. After attending New York University for two months, he left to become a full-time actor. Wright began appearing off-Broadway in New York City and Washington DC, and in 1990, he appeared in his first major film as an attorney in Presumed Innocent, which starred Harrison Ford. In 1991, Wright joined John Houseman's national touring repertory company The Acting Company with productions of A Midsummer Night's Dream and Athol Fugard's Blood Knot. In 1994, he was cast as Norman "Belize" Arriaga in Tony Kushner's award-winning play Angels in America. His portrayal of a gay nurse forced to take care of Roy Cohn as he dies of AIDS won him the Tony Award for Best Featured Actor in a Play. In 1996, Wright portrayed painter Jean-Michel Basquiat in the film Basquiat, to critical acclaim. Throughout the 1990s and early 2000s, Wright appeared in both leading and supporting roles in such films as Celebrity (1998), Ride with the Devil (1999), Shaft (2000), and Boycott (2001), where he gave an AFI Award-winning performance as Martin Luther King, Jr.. In 2003, Wright reprised his role as Norman "Belize" Arriaga in HBO's award-winning adaptation of Angels in America. His performance garnered him an Emmy award as well as a Golden Globe award for Best Supporting Actor in a miniseries. In 2004, he appeared in Jonathan Demme's remake of The Manchurian Candidate. In February 2005, Wright returned to HBO Films in Lackawanna Blues. He also guest starred on The Young Indiana Jones Chronicles and Homicide: Life on the Street. Among his other film roles was Washington attorney Bennett Holiday in Syriana (2005). The same year, he played Bill Murray's eccentric Ethiopian neighbor Winston in Broken Flowers. In 2005, he starred in the play This Is How It Goes. He also appeared as one of the tenants in Lady in the Water. In 2006, Wright was featured as Felix Leiter in the James Bond movie Casino Royale. He reprised the role in Quantum of Solace. Wright at the Tribeca Film Festival on April 28, 2007. In 2007, Wright starred in the alien invasion suspense thriller The Invasion. In 2008, he portrayed Colin Powell in W. He portrayed Muddy Waters in Cadillac Records, a biopic, loosely about the rise and fall of Chess Records. In 2010, Wright played Jacques Cornet in the world premiere run of A Free Man of Color at the Vivian Beaumont Theater of the Lincoln Center for Performing Arts in New York City. Wright plays Beetee in The Hunger Games film series, starting with The Hunger Games: Catching Fire, released in November 2013. He also landed the role of Dr. Valentin Narcisse in season 4 of Boardwalk Empire, starting in the fall of 2013. Wright married actress Carmen Ejogo in August 2000. They have a son named Elijah and a daughter named Juno and lived in Brooklyn, New York. They have since divorced. In 2004, Wright received an honorary degree from his alma mater, Amherst College. Wright has been a longtime activist working to end resource-related conflicts. In 2011, Wright established Taia Lion Resources, a mineral exploration company focused on ethical and sustainable mining in Sierra Leone. In August 2012, Wright's conflict-free mining philosophy was highlighted in a video by the Enough Project. ↑ "Jeffrey Wright". The New York Times. ↑ "Jeffrey Wright – About This Person – Movies & TV – NYTimes.com". Movies.nytimes.com. Retrieved 2013-01-02. ↑ Meza, Ed; Siegel, Tatiana (January 2, 2008). "'Bell' man takes on Bond". Variety. Retrieved January 2, 2008. ↑ Moaba, Alex (March 6, 2013). "Jeffrey Wright Joins 'Boardwalk Empire'". Huffington Post. ↑ "Jeffrey Wright Biography (1965?–)". Filmreference.com. Retrieved 2013-01-02. ↑ Wright, Jeffrey (2012-08-16). "Creating Conflict-Free Companies for the 21st Century". Huffingtonpost.com. Retrieved 2013-01-02. 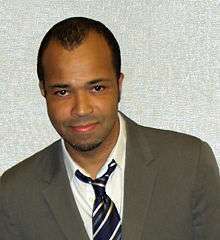 ↑ ""Jeffrey Wright: Conflict-Free Philosophy" August 14, 2012". Enoughproject.org. 2012-08-14. Retrieved 2013-01-02.